Clermont Springs Deli on Beechmont Ave. – Go There. Try That. I have a new obsession. 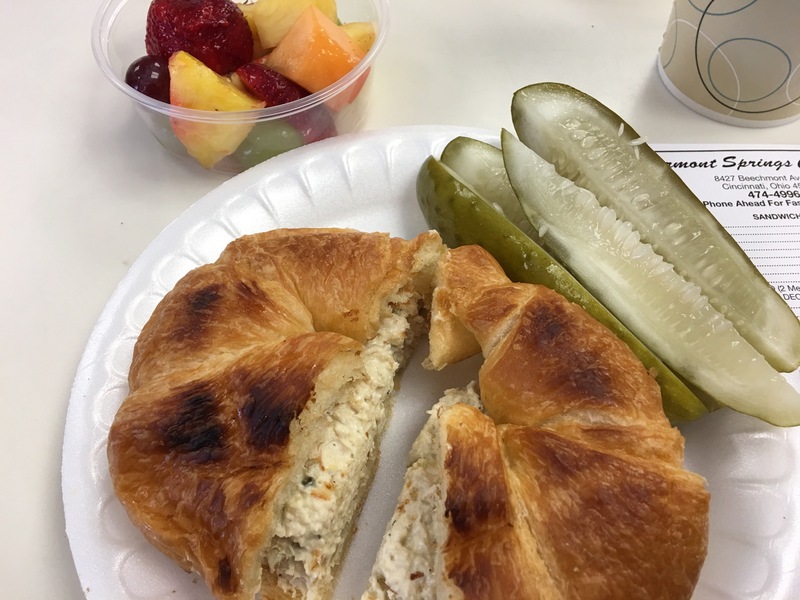 Thanks to a recommendation from my awesome hairdresser at Black Cat Salon, I can’t quit stopping by Clermont Springs Deli for simple, delicious, affordable, quick, and healthy food. So here’s the thing- Clermont Springs Deli is a hidden gem. Sitting off Beechmont in a side storefront, it’s part traditional convenience store, part liquor store, and part deli. 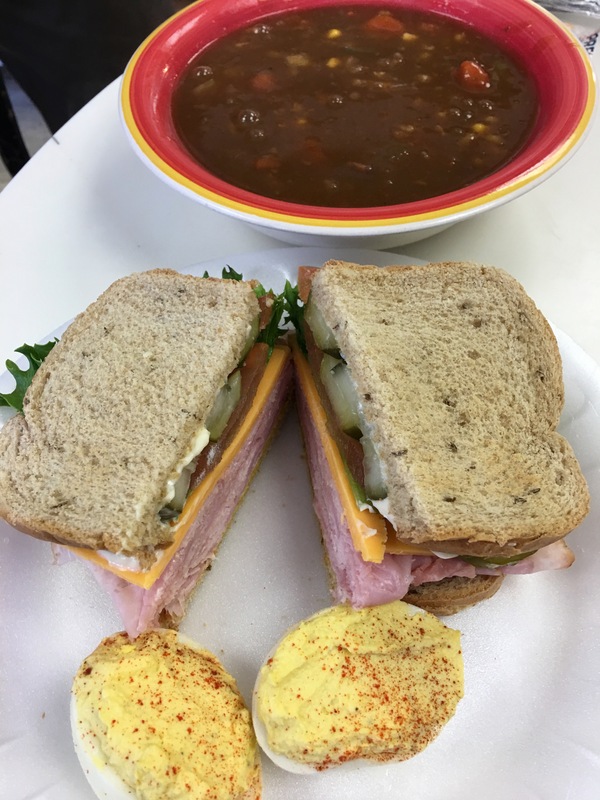 Ham and cheese on rye with beef vegetable soup. This chicken salad is everything! Friendly neighborhood service. Local ownership. Must-have homemade chicken salad (delicious on its own, but even better on a toasted croissant). Homemade soups and dressings (oh, that ranch)! Boar’s Head meats and cheeses (order a sandwich to your liking). Keep it healthy with fresh mixed fruit, chopped fresh veggies (and ranch), and salads. PICKLES (my favorite food) (deli pickles- and they will even quarter them for you if you’d like). 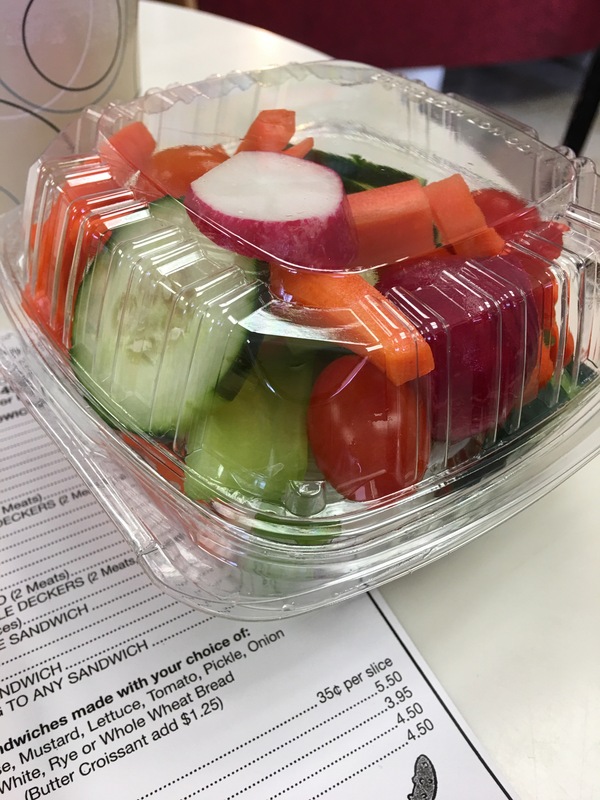 I stopped in the other day just to get fresh veggies and ranch as a snack while running errands! If you want to pop in for sandwiches, there are several small tables next to the deli counter. Feel free to sit and eat. My husband loved his sandwich! Or, if you want to grab food to-go, they have various container sizes to meet your carry out needs. This deli might be little, but it’s clean, fresh, and well-stocked. Grab a BLT or pastrami on rye, some homemade pasta salad or potato salad, some fruit . . . and if you’re feeling indulgent, one of the incredible desserts! If you’re on the east side, stop by Clermont Springs Deli for great service, hearty portions, and fresh food that tastes like mom made it. P.S. I feel a picnic lunch coming on as soon as the weather finally warms up! GO THERE (Clermont Springs Deli)! TRY THAT (chicken salad)! I’ll definitely check it out this weekend!!! !